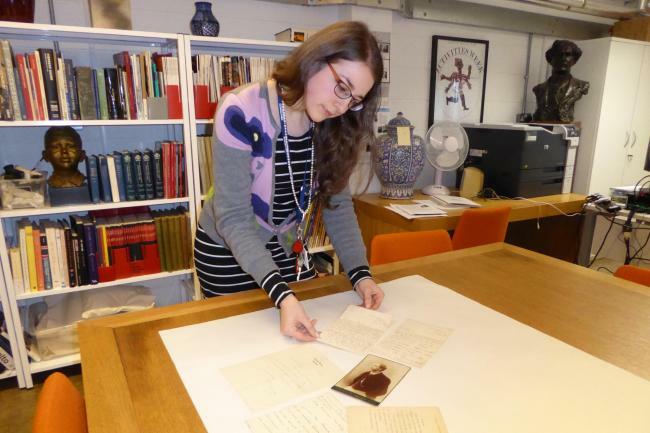 There has been some great media coverage today of our exciting finds within the records of Francis Newbery, ex Director of the School! The New Year has brought me to a new part of the Glasgow School of Art’s institutional Archive to catalogue and I have begun work on the papers of the Directors of the Glasgow School of Art (GSAA/DIR). These papers are arranged chronologically, by Director and the papers of many of the early Directors, from the first ‘Principal’ Henry MacManus to James Gray, Director 1932-1933, have already been described on the catalogue, so my job will be to describe the papers of the later directors so that they, too, can be discovered by researchers. I knew that some of the most exciting of the Directors Papers were that of Francis Newbery, Head of the Art School during one of the most dynamic periods in the School’s history, and so, although the majority of his papers were already listed, I was thrilled to find that one box of material relating to him had not yet been catalogued, so that I could discover some gems. Francis Henry Newbery, known as Fra Newbery, was the Headmaster and Director of the Glasgow School of Art from 1885 to 1918. During that time the profile of the School was raised from that of a moderately successful institution to one an international reputation. His success at Glasgow School of Art was led by the acclaim and notoriety surrounding the work of designers and artists such as Charles Rennie Mackintosh, Margaret Macdonald, Frances Macdonald, Herbert McNair, Jessie M. King and others working in the 1890s in Glasgow. Newbery also oversaw the erection of the new School building at 167 Renfrew Street and favoured the plans of Mackintosh. Newbery devised his own curriculum which led to the award of a Diploma, and brought in teachers from around the United Kingdom and Europe, including the Belgian Symbolist painter Jean Delville, the English Decorative artist Robert Anning Bell and, as Head of Architecture, the French architect Eugene Bourdon. Newbery invited leading figures in the art and design worlds to lecture at the School including Walter Crane, C.F.A. Voysey, William Morris and Lewis F. Day. In 1918 he was granted early retirement on medical grounds, and moved to Corfe Castle, Dorset where he continued to paint, mainly in the field of public art. 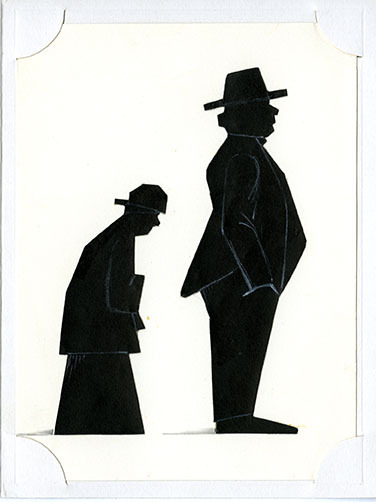 The box of Newbery material I discovered was deposited later than the rest of his working papers and included some correspondence from his time at the Art School in addition to papers from after his retirement and family records and photographs. 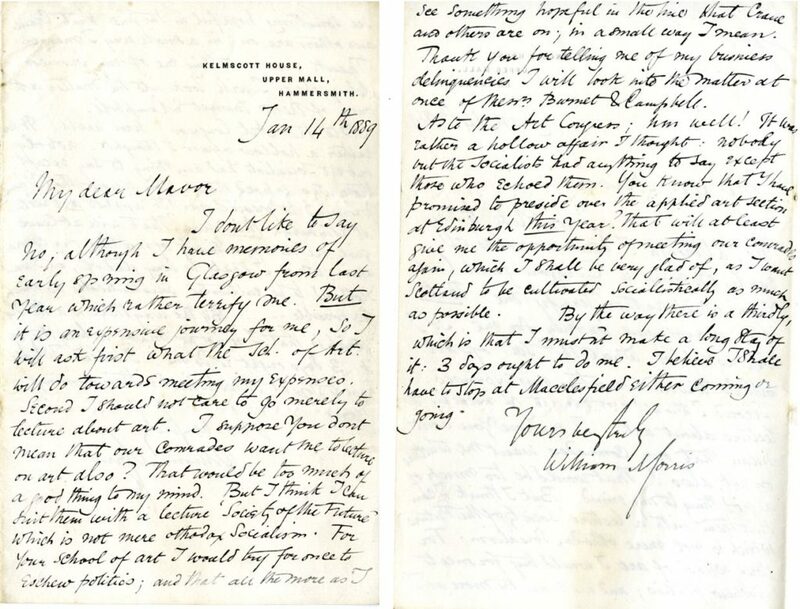 Some of the correspondence in this box is from some rather famous names in the cultural sphere and includes correspondence between William Morris and a man called James Mavor. These four letters (DIR/5/38/1/1a-d) are concerning a trip to Glasgow Morris was planning, to deliver political lectures to the Socialist Societies in Scotland, and also artistic lectures to Art School Students. He lectured on ‘Arts & Crafts’ and on ‘Gothic Architecture’ during his visit in early 1889. A later letter, from 1927, is signed by H G Wells and thanks Newbery for sending him a copy of the School Masque: a show performed by students of the Art School (DIR/5/38/1/17). Other of Fra’s famous friends pop up in this series such as Walter Crane, Auguste Rodin, Charles Voysey, and P Wilson Steer. Many of these letters are great evidence of Newbery’s fantastic contacts across the world of Art and Design. 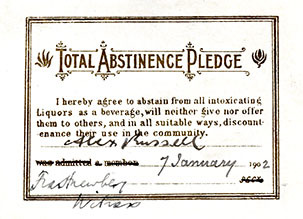 I also found some interesting working papers in the box (DIR/5/38/2), for example, a ‘Total Abstinence Pledge’ card signed by the Art School Janitor, who promised to abstain from any alcohol, and witnessed by Newbery, 07 Jan 1902. There is also a typewritten report on the Turin Exhibition in 1902 by Newbery: an exhibition in which the Art School won great praise and acclaim. Other, very visual, records I found within the accession were a collection of family photographs (DIR/5/38/7) including Fra at a number of different ages, and some of commissions he carried out in his retirement. This collection provides a great snapshot of the wide-ranging influence of Fra Newbery, as well as his family life, and was a joy to catalogue.